In honor of the official release of the After Series (I think it’s the) conclusion, After Ever Happy, I’ve been reviewing the previous books. Once a week. Well it seems that my timing is off, because today is February 24th, the the final book is out! This minor detail might bother other bloggers, but not yours truly. Nope. I’ve been a firm procrastinator my entire life, so why should now be any different? I’ll be posting my review of the final book in the dramatic saga that has become known as HESSA, next week. Tessa and Hardin’s love was complicated before. Now it’s more confusing than ever. AFTER WE FELL…Life will never be the same. The ever eloquent songstress, Katy Perry, gives an accurate summation of After We Fell, by Anna Todd (you can it find here and here) which catalogs the on/off relationship between Tessa and Hardin. But unlike the happy ending in the above video, there will be no wedding bells for Tessa. Ever. Or children. Hardin forbids it. Book three picks up right where the last one left off. After We Collided bombshell ending, where Hardin was saying sweet things like this: is completely overshadowed by his hateful, asisnine attitude through the first part of book 3. The meat of this book, though there is so much going on plot-wise, deals with Hardins overall mistreatment of Tessa. 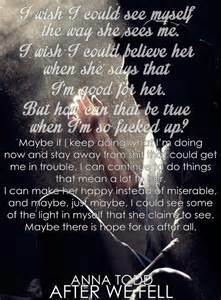 And he does mistreat her, so very badly. 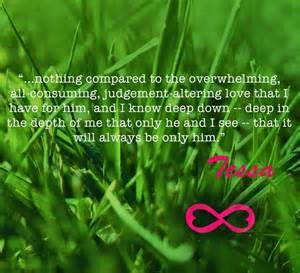 All Tessa a guilty of is loving him too much, believing in him too much. That quote came on the heels of Tessa finding out that Hardin had sabotaged her efforts to move to Seattle. She was hurt and rightfully angry. But all Hardin saw was that Tessa wanted to leave him. So he said the most hurtful thing he could think of. Becasue that’s what he does. He’s got a knack for saying the cruelest things in her most vulnerable moments and he never lets up until she breaks. At this point, even long-suffering me was at my ends with Hardin. Well, much to my appreciation Tessa manages to find the strength to pull herself away from this all-consuming, debilitating drama that passes for a relationship, only to be staggered, once again, when one of her only “friends” betrays her, in the most despicable way. As the story plays out, we readers follow Hardin through some very tough moments in his journey of self-discovery and watch him try, really try, to become a better person. 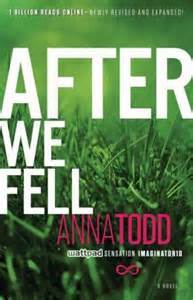 Anna Todd does a wonderful job of showing us the type of struggle that we can all relate to. If any of you have been following these reviews, you’ll know that I usually keep my opinions vague. That’s because when I read reviews on other blogs or on Goodreads, basically, what I want to know is what other readers loved or hated about the book, not the specific events of the story. Most times what I find is that I am not turned off of a story as easily as many readers. What I care about most is the story itself: if the characters and their feelings are being conveyed in a believable way. That realism is what I find most appealing about the After Series. 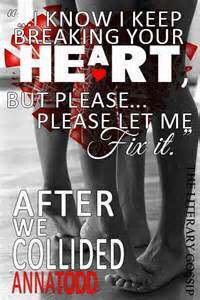 They are books about messed up people, whose lives collide in unexpected ways. I have loved them all, so far and I cannot wait to read the next one! Next Part 2: What’chya think?